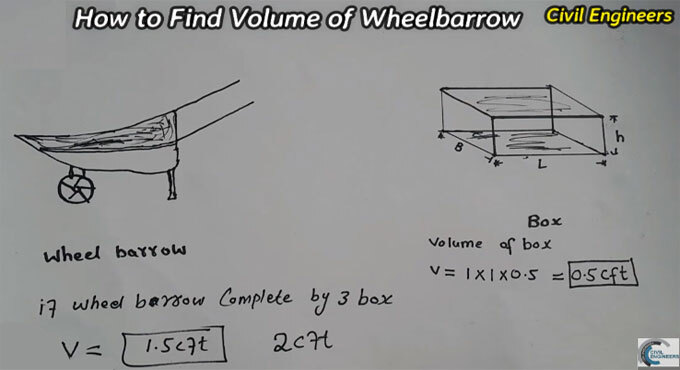 The civil engineering students often face problems to find out the volume of wheelbarrow as there are various types of wheelbarrow and they contain different types of volume. To resolve this issue, Sami Ullah, the renowned engineer, presents a useful video for civil engineering students. After finding the volume of wheelbarrow, the process for batching of concrete materials will be simplified. To start the calculation, you have to select a box and find it’s volume. Now fill this box by pouring materials and transfer the total quantities of materials (numbers of boxes) to the wheelbarrow to find out the volume of wheelbarrow easily. Or, if the wheelbarrow is filled with the volume of 4 boxes, the volume of wheelbarrow will be 4 x 0.5 = 2 cft.